A little Mexican girl and her family throw a surprise party for her tia (aunt). She makes her a special present of sentimental value. Tia opens her present and loves it. 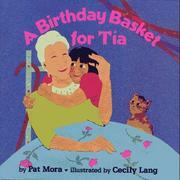 Mora, Pat, “A birthday basket for tia,” Children's Picture Book Database at Miami University, accessed April 24, 2019, https://dlp.lib.miamioh.edu/picturebook/items/show/7915.